Battle through Skuldafn Temple to reach Alduin's portal to Sovngarde. Reach Alduin's portal to Sovngarde. You cannot take any followers with you on the final two quests, so not only can they not fight alongside you, they cannot carry your burdens. Also, you can never come back here, so you need to take anything you want (particularly the unique items) in your one visit, making carrying space a concern. You will likely be of a high level when completing this quest, resulting in the loot being of higher quality, but better quality is penalized with higher weights. Only take the bare essentials, strip yourself of anything you don't normally use, though bear in mind you will face some tough fights, so if you rely on food or potions to heal you will need to bring enough. One set of armor, one melee weapon setup (one hand and shield, dual wield, or two handed), and one ranged weapon, should be all you carry. The Dremora ButlerDB, Dremora merchantDB, the Steed Stone power, and the Extra Pockets perk from the Pickpocket skill can all help to provide some relief. In order to free Odahviing, talk to the Whiterun guard standing on the second floor (there is a stone staircase near where the jarl is standing). After a short discussion, the guard will release Odahviing for you. You can also pull the chain to release the dragon yourself without talking to the guard, which is useful if the guard is incapacitated or there is a bounty on your head. Tell Odahviing you're ready to travel and he will fly you directly to Skuldafn. Upon arriving at the Skuldafn Temple courtyard, you'll encounter two dragons and multiple draugr. Battle or sneak your way past them to enter the temple complex. The two Towers (North and South) have only minor loot and won't get you any closer to the Temple itself. If you have a high enough sneak skill, it is possible to sneak past all enemies, including the dragons. It is also possible, though tedious, to scale the mountain beside you as high as you can go, and jump along the mountainside until you reach the temple. At this point you can drop down and sneak through the snowberries at the base of the mountain. After entering the Temple area, you come to a large chamber with draugr. Be careful of the dart trap in the western pathway. Continuing leads you to the first puzzle in Skuldafn, which is used to open two doorways. The puzzle consists of three pillars, each separated by a wall, and a switch between the pillars and the doorways. Each pillar has three pictographs: Eagle, Snake, and Whale. On the walls beside the two outside pillars are matching pictographs for those pillars. The west pillar is a Whale and the east is a Snake. Set the outer pillars so that the pictographs face each other (e.g., Snake faces Snake). Above each doorway are more pictographs. Above the east doorway is an Eagle. This way just leads to a treasure chest and a collapsed wall. Above the west doorway is a snake, which leads to the destination. Face the pictograph on the central pillar that matches the desired door to face north, toward the doors. Pull the lever to open door (with your back to the lever, you should see Eagle, Eagle, Eagle to open and close the dead-end door. With your back to the lever, you should see Eagle, Snake, Eagle to open and close the progressing door. You must close one door before you can open the other). The next small room is full of draugr, and the following one has multiple frostbite spiders who made good use of their webbing to block a door and cover a chest. The second puzzle room is solved by Whale—Snake—Eagle (upper level left, middle lower level, upper level right), with the solutions for the first and third shown above them and the second behind the platform. A chest can also be found behind the platform. Whirlwind Sprint can be used from the platform to bypass the puzzle. Enter the door to go to another section of Skuldafn Temple. Take out the draugr and keep moving (there isn't much loot around). Cross the bridge (from its eastern entry to the west, seen from entrance) but be careful of the pressure plate trap at the doorway to the next room. Activating it releases a lantern that lights up the oil slick ahead and also triggers a dart trap. Go up the staircase to meet three draugr, which can be dispatched easily with another oil slick and lantern. Pull the lever near the oil (in a small window) to open the gate on the other side of the room. Don't forget the chest (by the other window). Follow the wide tunnel, grabbing the contents of the chest on the right side. Be careful when you reach the large oil slick, as there is another lantern poised over it that will drop if you step on the pressure plate in front. It is a useful way to dispose of upcoming high-level draugr; by running away and leading him into it. 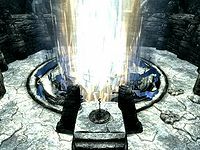 You will then arrive at a puzzle door guarded by a leveled draugr or dragon priest carrying the diamond claw needed to open it. The combination to the door is, from top to bottom, Fox—Moth—Dragon; this can be seen by examining the claw in your inventory. The next two rooms (the first large, the next small) are basically empty except for a word wall, which teaches you a word for the Storm Call shout. Also, just before the door to exit is a room to the right. There are some hidden gems in a pot on a shelf to the right: a flawless emerald, a ruby, and a diamond hidden by a linen wrap. You will end up on a large rocky platform, above where you first entered Skuldafn. Defeat the draugr who are there to meet you, (Hint: Unrelenting Force will be useful here) and take the wooden platform ahead of you (from where you exited the Temple) to go down a small tower that has some good loot on shelves and a large chest at the bottom. Returning to the top, you may notice two dragons above you, perched on columns. This is where you need to be to finish the quest. But before you can enter Alduin's portal to Sovngarde, you must get past a dragon priest named Nahkriin. This dragon priest can be tough if you don't take the fight to him. Additionally, if you engage the two nearby dragons at the same time, the fight can be much more difficult. However, the two dragons may not move from their perches or become hostile. When you reach the top of the stairs Nahkriin will notice you and make his way toward his staff. It's best to start your assault immediately. He doesn't attack until he gets his staff, so get to him quickly. After Nahkriin grabs his staff, he'll turn around to face you. Be careful with this one as his staff does 50 shock damage per second. Any shock resistance potions or enchanted apparel you have would be useful now. He doesn't start off with full health, so if you jumped on attacking him before he grabbed his staff you should be able to dispatch him in short time. He can also be pushed off the ledge, and will fall to his death. After defeating Nahkriin, pick up his staff and mask and activate the Dragon Seal. Alternatively, you can bypass the fight by getting to the portal before Nahkriin can remove his staff. This can be achieved with the Slow Time shout, although you won't be able to collect his mask, which will make it impossible to complete the untracked quest to collect all the dragon priest masks. If this quest is active, every dragon that you encounter on the landscape while traveling will shout at you, "Skuldafn fen kos dinok." (Skuldafn will be [your] death). Sometimes the Whiterun Guard who releases Odahviing dies in battle. It is also possible that the guard will repeat the "Wait... I know you" line instead of releasing Odahviing. In these cases, you must pull the chain yourself to release Odahviing. If you can get between Nahkriin and his staff he won't attack you, as his focus is entirely on removing it. You can proceed to kill him though. If you kill Nahkriin before he is able to retrieve his staff you do not need to remove and replace it; you can simply walk into the portal. The journal entry states that Skuldafn is in the Jerall Mountains, though it is actually in the Velothi Mountains. When setting Odahviing free, if you talk to the guard before allowing Farengar Secret-Fire to complete his interactions, Odahviing will become hostile and you won't be able to talk to him. Can be fixed on PC by selecting Odahviing in the console and using the command "resetai". Near the exit to Skuldafn Temple, there is a draugr whose patrol path makes it try to walk into a wall. It will continue to do this until it dies or detects you, and will return to this position if it loses sight of you. If the puzzle door or rotating pillars do not work, check here for possible fixes. A workaround for the second door puzzle if the rings will not move, is to use Whirlwind Sprint to get to the wooden platform and shimmy your way past the drawbridge. 10 The captured dragon Odahviing has revealed that Alduin has escaped to Sovngarde, the Nord underworld, where he feeds on the souls of the dead. His portal to Sovngarde is located in the ancient dragon temple of Skuldafn, high in the Jerall Mountains. The only way to reach it is to set Odahviing free so he can fly me there. 100 The captured dragon Odahviing revealed that Alduin has escaped to Sovngarde, the Nord underworld, where he feeds on the souls of the dead. His portal to Sovngarde is located in the ancient dragon temple of Skuldafn, high in the Jerall Mountains. I set Odahviing free, and he flew me to Skuldafn as agreed. Now I just have to reach the portal. 300 Finishes quest The captured dragon Odahviing revealed that Alduin has escaped to Sovngarde, the Nord underworld, where he feeds on the souls of the dead. 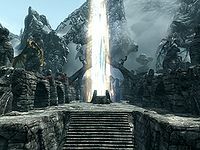 His portal to Sovngarde is located in the ancient dragon temple of Skuldafn, high in the Jerall Mountains. I set Odahviing free, and he flew me to Skuldafn as agreed. I fought my way to the top of Skuldafn, and entered Alduin's portal to Sovngarde. The following empty quest stages were omitted from the table: 0, 1, 5, 15, 20, 30, 45, 55, 60, 120, 160, 200, 220, 240. On the PC, it is possible to use the console to advance through the quest by entering setstage MQ303 stage, where stage is the number of the stage you wish to complete. It is not possible to un-complete (i.e. go back) quest stages, but it is possible to clear all stages of the quest using resetquest MQ303. This page was last modified on 3 November 2018, at 04:39.